The majority of funerals take place in a church, in a cemetery or crematorium chapel, or at the graveside in a cemetery or churchyard. Some religions would hold a service at a synagogue, temple or mosque or even a village hall. Unlike weddings, funerals can be held almost anywhere, even at a private residence. Please click here for a copy of our ‘Alternative Funeral Venues’ brochure to give you some ideas. At a church service the minister will normally conduct the funeral service and stipulate what can or cannot be done within his church. As a general rule and following consultation, the minister will be quite happy for relatives or friends to participate in the funeral service. In other places anyone may be asked to conduct a funeral service, a religious minister of any denomination, a non-religious celebrant, a humanist, the funeral director, a friend or relative or a member of a connected club or organisation. We will be pleased to contact the person taking the service on your behalf or advise and work with you to construct the most appropriate form of service. It is important that you have the sort of service you feel most comfortable with. When a minister is involved they normally contact the next of kin and arrange to meet in order to plan and discuss the most appropriate form of funeral service. This is the time to mention any special music, readings, poems or tributes you may want during the funeral service. You may like a tribute of personal memories spoken by a close personal friend. Remember that each service is unique and a tribute to the person who has died. The address is a short history, a speech about the person who has died. Usually delivered by the minister at a funeral service but sometimes by a relative or friend. It is important to give this some thought before the funeral. It gives a personal touch to the service. How did he or she like to be known. Perhaps they always used their middle name, or a nickname. Most importantly their character. Did they tell terrible jokes? Were they happy and bubbly? Often a humorous family story can make all the difference to a funeral service. Almost any music can be used. Organ music, musical instruments, personal CD's or the electronic system at the crematorium. At a church there is usually an organist. Arrange the music and hymns in conjunction with the minister. Remember that some hymns have more than one tune. At a crematorium we are limited to time but it is possible to play two or three pieces of music, or a double service time can be booked. We will be pleased to help and advise on music to be played during the service. Should we view at the chapel of repose? Many people gain considerable comfort in visiting to pay their final respects, whilst others prefer to keep their personal memories of happier times. You can ask for the coffin to be brought home so you can pay your respects there if you wish, or it may rest at our Chapel of Repose. We normally supply a dressing gown styled robe to dress the person who has died. You may prefer to supply us with some personal clothes. Certainly, spectacles or dentures if normally used help us to present a more natural appearance. Artefacts such as photographs or cards, perhaps a small flower may be placed in the coffin. You may need to decide whether items of jewellery should be left on or returned to the family. If you wish to visit our Chapel of Repose we ask you to make a mutually convenient appointment. We provide bearers in all cases. Members of the family or friends may wish to assist. This is possible, but we will provide some simple instructions beforehand. The only essential vehicle required for a funeral is a hearse. 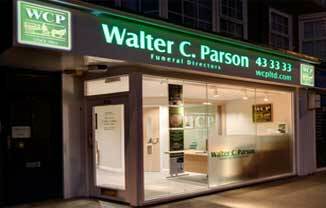 We provide a hearse with all our funerals. Special hearses pulled by horses are available at an additional cost. Please click here for details. Most of our funerals provide one limousine for the family. Each limousine seats seven passengers. Additional limousines are available at an extra cost. Our limousines are equipped with umbrellas for your use in inclement weather.